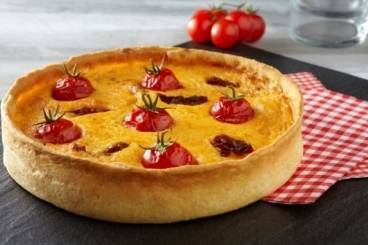 A simple quiche made with red pepper, sun-dried tomatoes and candied cherry tomatoes. Roll out the cold pastry in a tart tin and cover with parchment paper. Fill with baking beans and bake in the oven for 10 minutes. Leave to cool then remove the baking beans and parchment paper. Meanwhile, rinse, chop and de-seed the peppers. Then cook in boiling, salted water for 10 minutes, then drain. Blend to a thick sauce. Whisk together the eggs and the egg yolks. Season with salt and pepper and then add the blended red pepper. Mix in the milk and the cream. Pour the quiche mixture into the pastry case and add the sun dried tomatoes. Bake the quiche at 180'C for 10 minutes. Remove from the oven and press the cherry tomatoes gently into the top. Cook for a further 8 minutes. Enjoy the quiche either hot or cold.